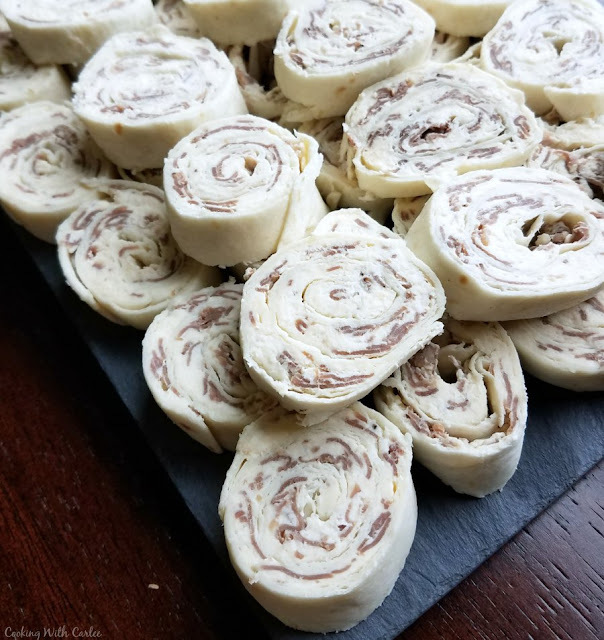 Perfectly easy finger food that is made to be snacked on, these 4 ingredient roast beef pinwheels are a great party starter! Simple flavorful finger foods are a must at a party. These 4 ingredient roast beef pinwheels fit the bill and are a great make ahead snack to boot! So go ahead and put them on the menu at your next shindig. You'll be glad you did! I debated long and hard about how to incorporate the roast beef feast into Little Dude's Dr. Seuss party. Originally I was going to do sliders to go with the green egg and ham sliders. Then I decided that was too many sliders and I needed variety. Of course I decided to whip up some hot turkey and ham sliders at the last minute, sort of undoing that logic. That's just the way things go around here sometimes. I can't help it. By the time I reversed course on how many sliders one party could handle, I had already set my heart on these fun rollups. With the help of horseradish cheddar, highlighting that perfect combo of roast beef and horseradish was easy to do and without the risk of overwhelming people with horseradish. These took a few minutes to whip up the morning of the party. An hour or two before the gang arrived, I sliced and arranged them on a platter. A bit of plastic wrap and another trip to the fridge and all I had to do was pull them out when it was time to eat. There were just a few left after the party so I put them in a container in the refrigerator. I offered to send them out to the garage for the guys that night, but my husband refused. However he quickly found them the next morning and ate them all without even offering to share. After his reaction over the zesty beef pinwheels and now these, I think I should make these kind of snacks more often. Do you have a favorite pinwheel recipe? What are your favorite flavor combinations? Grate the horseradish cheddar into the cream cheese and stir until combined. Chop the roast beef and stir into cream cheese mixture. Spread over tortillas and tightly roll. Wrap with plastic wrap and refrigerate for at least an hour but up to a day. Slice into rolls about 1/4-1/2 inch wide. *If you don't have horseradish cheddar, feel free to use regular cheddar and add prepared horseradish to taste. You make the BEST pinwheels! I have been making them for the boys lunches from one of your other recipes. So good and the perfect finger food! Thank you! I am so glad they are liking them! Hi Carlee, why didn't I read this post before I went to pick something up for dinner? It's a bit hot & I really don't feel like cooking so we opted for sandwiches. After standing in the supermarket debating pork or beef? Pork or beef? Followed by sandwich or wrap. WE went for pork sandwiches, had it been the other way round we could have had these!.. Okay so we don't have horseradish Cheddar, but I do have mature Cheddar and horseradish sauce. So close! So close! It is definitely the season where spending too much time in the kitchen just isn't fun! Carlee, these sound wonderful! I think I would've held the leftovers back for myself, just like your husband did! Thank you for hosting the Recipe Roundup. Thank you. That was definitely a high compliment from him! 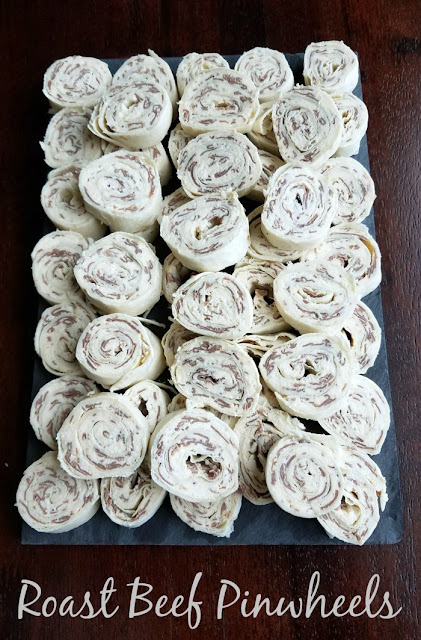 These little roast beef pinwheels would be such a good little snack for a summer day. They look delicious. They are for sure! Thank you! My MOST favorite part of the Grinch is when he carves "the roast beast"! 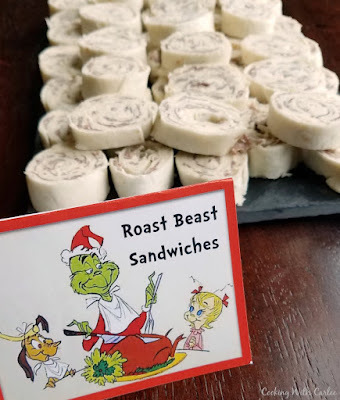 LOVING these Roast Beef Pinwheels! Thanks so much for sharing them at the Whimsical Wednesdays Link Party! Ha! Little Dude loves everything about that movie! Intrigued! 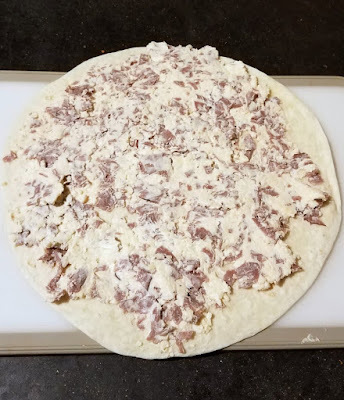 I've not made pinwheels with roast beef before, but that cheese... horseradish cheddar? I need to try this!